This 2018, it may be safe to state that the Ruby on Rails is one of the hottest topics. Since we encountered the time of the digital transformation, the web development has quickly exceeded expectations and opened up opportunities for the developers as well as for the business owners. The Ruby on Rails has been the first preference in building up the websites potentially. To know it further, we have come out with these fascinating advantages of the web application framework, which will effectively help the website developers in designing the pages of sites easily. RoR uses the clean programming language and follows DRY (Don't Repeat Yourself), KISS ( Keep It Short and Simple) and programming best practices that guarantee high-quality and bug-free development. The system empowers a test and behavior driven approach which when strictly followed, creates superior quality software architecture with 100% code coverage. The good quality and consistency of the code likewise imply that the developer will invest lesser time and energy in finding and fixing bugs. Ruby on Rails is completely free and you do not have to spend an additional fee on it. It also runs on Linux, thus, you can save a cost. Regardless of whether you transferred from Microsoft Windows or ASP, you are free up with any issues. 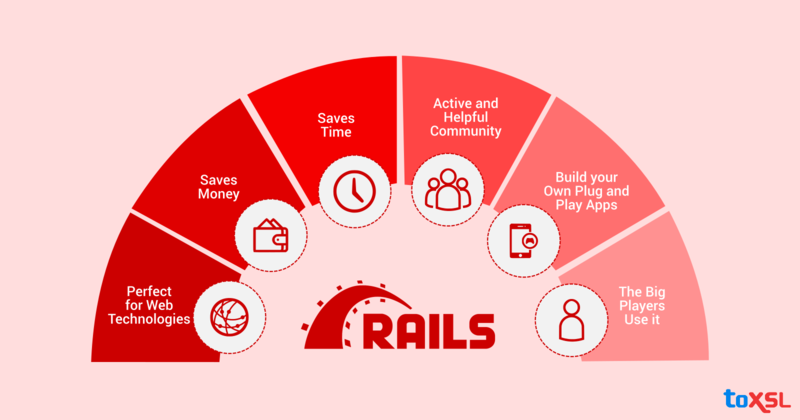 On the other hand, Ruby on Rails is easy to understand and use, so the developers can move speedier in any of the development stages, so saving time is extremely conceivable. Ruby on Rails, perfectly fits in any type of website regardless of what industry, company or business you belong. For its powerful use in the web development, the ability of Ruby on Rails to keep running on the prototype makes it as the best option. In any types of problems emerging in the early web development stage, the developers can ultimately fix whatever issue that is. You can gain assistance from the varieties of online community when you require any help with the ongoing project. With that thought, you can get extensive advice and knowledge from experts across the globe. These experts have their own experiences when it comes to web app development and they will impart their expertise to the individuals who are willing to learn. Ruby on Rails is providing a simple and easy coding method for the developers to follow. With its use, each project created is not hanged and the flow of the processes is in a better state. In this way, the result can be delivered within the scheduled deadline. With regards to the web app development, the changes had taken over the most recent couple of years and numerous developers have changed their approach not simply to give the best service to the clients, however, also to make the internet a better place to stay. Presently, we are all enjoying these opportunities. With the advantages offered by Ruby on Rails, we will for sure flourish this 2018 and for many more years. Looking to get your application developed? ToXSL can help! Look at our portfolio to see how we are changing the shape of the software industry by providing Ruby on Rails Developer. Get in touch with us now!